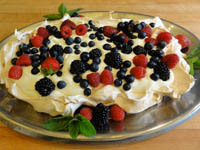 Here is a beautiful, light, and delicious dessert for the beginning of summer when the red berries are in season. Using an electric mixer, beat the egg whites with a few grains of salt and using the whisk attachment slowly at first, then increase the speed to high. When the egg whites are stiff, add the sugar, one tablespoon at a time. When the meringue is firm and glossy, beat in the vinegar and stop whisking immediately. Using a rubber spatula, turn the meringue onto the center of the parchment and shape it into an oval, approx. 10 inches by 7 inches, and make a well in the center for the cream and fruit. Bake the meringue in the oven, until firm around the edges, about 1 hour. Remove the meringue from the oven and let cool completely on a wire rack.